The largest alpine lake in North America, Lake Tahoe is a popular recreation destination visited by nearly 3 million people annually. In summer, it’s a haven for its beaches, freshwater lake activities, and hiking, while in winter, skiers flock to the numerous resorts to enjoy the 400+ inches of annual snowfall. By June, once the snow clears, Lake Tahoe is a mecca for trail running. For road running, it’s important to know the best spots, since many of the main roads are generally not safe for running, due to heavy traffic and small shoulders. 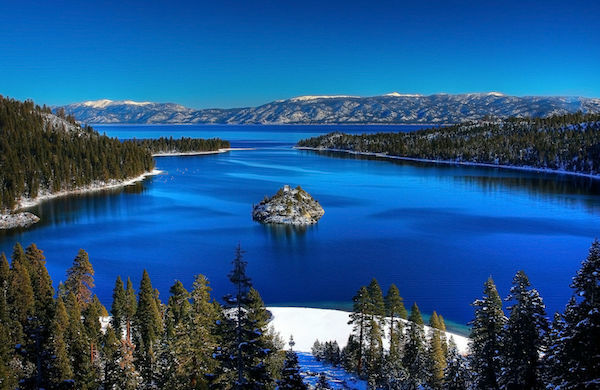 Straddling the California and Nevada borders, the area is divided into South Lake Tahoe, anchored by South Lake Tahoe and Emerald Bay, and North Lake Tahoe, anchored by Tahoe City, Truckee, and Incline Village. Special thanks to Miles at Alpenglow Sports for his guidance on Lake Tahoe running! 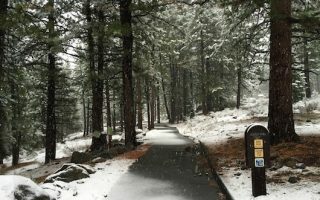 There are several off-road, multi-use paths in Lake Tahoe that are great for running: the West Shore Trail, Truckee River Trail and the Truckee Legacy Trail. In Tahoe City, there’s some nice running around the marina and golf course. On the north/east side, the spectacular East Shore multi-use path will open in the spring if 2019. There are also some nice bike paths in South Lake Tahoe. The 7-mile loop around Donner Lake is also a treat. 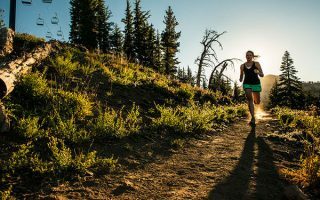 We’ve also researched some of the nicest spots for easy-to-moderate trail running, featuring some of the Tahoe area’s famous meadows. A few notes about running in Tahoe. Be aware that the base altitude is at 6200 feet and that outside of the areas right along the lake, the terrain is generally hilly. Also know that some of the prettiest roads right along the lake aren’t safe for running due to heavy traffic and poor shoulders, although there’s continued effort to complete bike paths around nearly the entire lake. And in winter, the area’s copious snowfall affects the runnability of trails and multi-use paths. 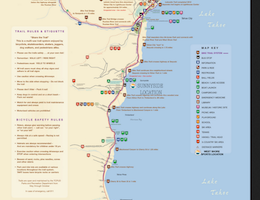 An 11-mile path from Meeks Bay north to Tahoe City along the western shore of Lake Tahoe is a great option for running. The nicest section is the ~6 miles from Homewood to Sunnyside -- right along the lake and quite flat. Connects to other trails in Tahoe City. 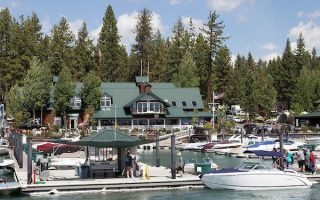 Best running options in the Tahoe City area are the the Truckee River Trail to Squaw Valley, a golf course loop involving Fairway Dr., and a paved path along the marina and paralleling N. Lake Blvd. for 2.7 miles, the last mile of which is a steep climb. 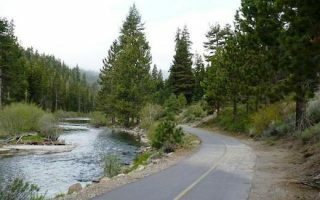 One of the better off-road running options in the Tahoe area, this paved trail runs for just over 5 miles between Squaw Valley and Tahoe City, paralleling River Rd. (RT. 89). Quite shaded and with occasional views of the Truckee River. 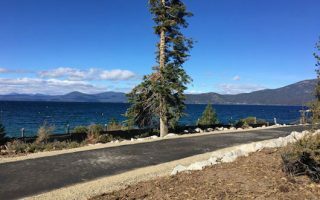 The spectacular new East Shore Trail, which heads 3 miles south to Sand Harbor, is scheduled for completion in the Spring of 2019. It's gonna be great!! Also in Incline Village is a 3 mile bike trail, known as 'Joggers Trail', running along Lakeshore Blvd. Our recommendations on some of the best spots to run in the South Lake Tahoe area. The Rubicon Trail is a fantastic trail run around Emerald Bay. Also some bike paths, meadow paths, and quiet residential streets near Heavenly Ski Resort. Pleasant gravel path along the Truckee River, from Truckee north to Union Mills. 4.4 miles one-way, mostly flat except for one steep climb. Fairly shaded, with nice views of the river much of the way. 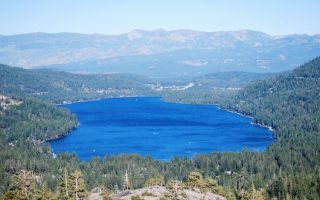 An easy-to-follow 7-mile loop around Donner Lake, which is at the northern end of Lake Tahoe, near Truckee. Donner Pass Rd. on the northern side, has a bike lane and nice lake views, while S. Shore Rd. on the southern side is quieter but lacks water views. Lake Tahoe is a trail runner's dream. Here, our recommendations for easy-to-moderate trail runs that are accessible and appropriate for the everyday runner. There are TONS of resources for more challenging, technical trail running in Tahoe. Lake Tahoe’s weather is one of extremes. 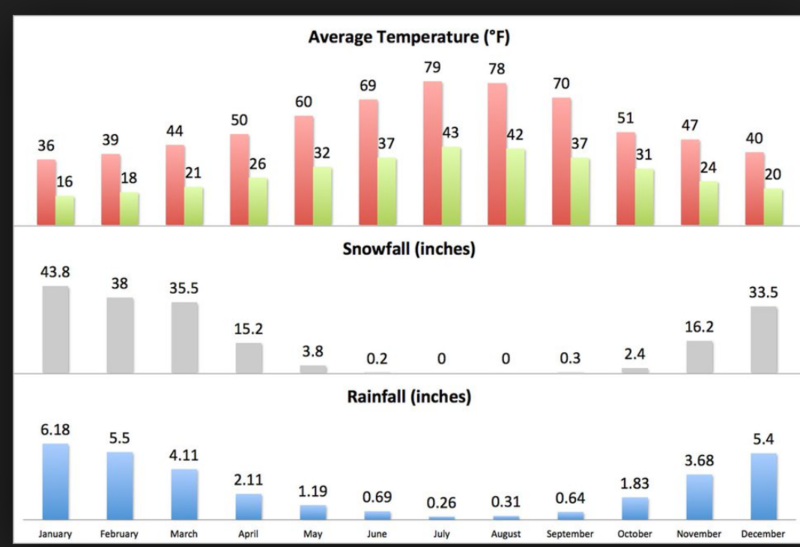 Winters are cold and snowy, featuring nearly 500 inches of snow. The snowpack can last from November to May, affecting the runnability of trails and multi-use paths. Winter high temps (at lake level) average in the 30s (3C), dipping into the teens (-7C) at night. Summers are warm and dry, with average high temperatures in the high 70s (25C) and reliably sunny weather. Even summer nights can be cool, averaging in the 30s and 40s. You’ll need a layer(s) at any time of year. Since this is mainly a tourist/vacation destination, there’s a large number of hotels in the area. In South Lake Tahoe, clusters tend to be near South Lake Tahoe City. In North Lake Tahoe, the hotels in Tahoe City, and near the ski areas of Alpine Meadows and Squaw Valley have access to some of our favorite running spots. For a dedicated running store, you’ll have to go to Reno. But there are many outdoor gear stores in the Tahoe area that also carry running gear — and especially trail running gear. In South Lake Tahoe, good bets are Big 5 Sporting Goods. In North Lake Tahoe, Alpenglow Sports is a great bet, with many knowledgeable employees. Special thanks to Miles at Alpenglow Sports for his guidance on Lake Tahoe running! Tahoe Mountain Sports, Willard’s Sports Shop and Lakeshore Sports also carry all sorts of gear.